Gustavo Dudamel and Juan Diego Florez during the Los Angeles Philharmonic season opening night gala at the Walt Disney Concert Hall on October 7, 2010 in Los Angeles, California. Programmes at the press conference marking Gustavo Dudamel's appointment as the new Music Director of the Los Angeles Philharmonic, on September 30, 2009. Gustavo Dudamel makes his Hollywood Bowl debut as the director of the Los Angeles Philharmonic in Los Angeles on Saturday, October 3, 2009. Gustavo Dudamel shakes hands with members of the Youth Orchestra Los Angeles during his Hollywood Bowl debut as director of the Los Angeles Philharmonic in Los Angeles on Saturday, Oct. 3, 2009. The 28-year-old Venezuelan conductor was welcomed with a free community concert entitled "¡Bienvenido Gustavo!" Dudamel conducted the Los Angeles Philharmonic in Beethoven's Symphony No. 9 in D minor, Op 125. Gustavo Dudamel conducts the Simon Bolivar Youth Orchestra of Venezuela on their opening night at the Royal Festival Hall, South Bank Centre, London, April 2009. Gustavo Dudamel makes his Hollywood Bowl debut as director of the Los Angeles Philharmonic in Los Angeles on Saturday, October 3, 2009. Los Angeles Philharmonic Music Director Esa-Pekka Salonen, left, poses with Venezuelan conductor Gustavo Dudamel, center, and Board of Director President Deborah Borda, during a news conference Monday, April 9, 2007, at the Walt Disney Concert Hall in Los Angeles. Dudamel's wife Eloisa Dudamel is at far right. Gustavo Dudamel conductor of the Simon Bolivar Youth Orchestra of Venezuela visits the Houses of Parliament, hosted by Ed Vaizey MP, Shadow Minister for Culture. Peru's tenor Juan Diego Florez, second left, is applauded by the Youth Symphonic Orchestra as he stands with his wife Julia Trappe, second right, Jose Antonio Abreu, left, and conductor Gustavo Dudamel at the Teresa Carreno theater in Caracas, Friday, Jan. 30, 2009. Gustavo Dudamel during a rehearsal at the Teresa Carreno theater in Caracas, Venezuela, Tuesday, June 2, 2009. This photo shows conductor Gustavo Dudamel leading the YOLA Expo Center Youth Orchestra during a rehearsal in Los Angeles. 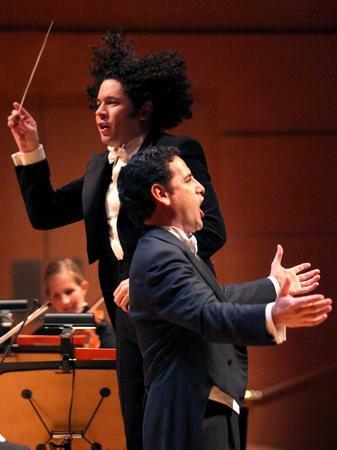 Dudamel worked with children from South Los Angeles, before posing for photos with them, signing their scores and singing "Happy Birthday" to a kid named Daniel who turned 12 that day. Gustavo Dudamel conducts a concert in Gothenburg in May 2010. Dudamel conducts the Gothenburg Symphony Orchestra.